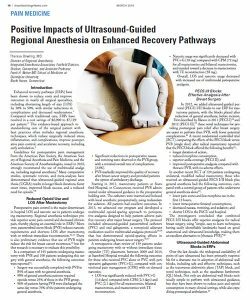 SSRA’s mission is to provide high quality regional anesthesia training in the techniques of ultrasound guided nerve blocks and regional anesthesia program development in the context of ERAS (Enhanced Recovery After Surgery). A robust regional anesthesia program is a critical component of ERAS programs, which involves a multimodal, multidisciplinary approach to the care of the surgical patient with the care protocol being based on published evidence and best practices. Anesthesia departments will be the driving force for Enhanced Recovery After Surgery Programs in the next decade, so it is imperative as an anesthesiologist to have the knowledge and skills to be prepared for these changes. SSRA is dedicated to remaining current and connected in response to the rapidly changing paradigm of the practice of medicine. To help you do the same, Dr. Bowling is excited to provide live multidisciplinary seminars, featuring nationally recognized expert faculty who represent the key stakeholders for successful ERAS program development: anesthesiologists, surgeons, administrators, nurses, and pharmacists. Rounding out an ERAS seminar like no other, the afternoon session is comprised of in-depth clinically-oriented regional anesthesia didactics and small-group hands-on ultrasound scanning on live models, with a faculty-to-student ratio of less than 1:10. It’s a topic that is both timely and critically important – ERAS protocols and their potential benefits in addressing the opioid crisis. IAA is proud to share this recent video interview with Theresa Bowling, M.D. and encourages every anesthesiology professional to take note and join the conversation. During the 2018 annual meeting of the American Society of Anesthesiologists, Anesthesiology News spoke with Theresa Bowling, MD, the director for regional anesthesia at Integrated Anesthesia Associates, in Shelton, Connecticut. In this insightful video recently published on Anesthesiology News online, Dr. Bowling discusses the use of enhanced recovery programs, how they have improved pain management and how they can help address the opioid crisis.